Recently, Harvard University instituted a controversial new policy that prohibited men from visiting one of its on-campus gyms during certain hours to accommodate women who have cultural objections to exercising in mixed-gender environments. Some label the policy preferential treatment because it mostly benefits Muslim women, most of whom are from other countries. Others applaud Harvard for its sensitivity to other cultures. This is the type of scenario that education professor Christopher J. Lucas and co-author Teresa Brawner Bevis, who teaches at Crowder College, hope their new book will put in perspective as administrators tackle issues created by the presence of international students on America’s college campuses. 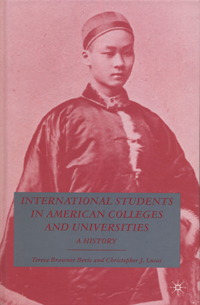 The book highlights the history and experiences of international students at American universities. This historical overview runs the gamut from foreign students in antiquity to the opening years of the 21st century. It covers topics as diverse as international students and terrorism, enrollment decline after Sept. 11, increasing competition in recruiting international students, McCarthyism and the cold war, and immigration policy.